When you schedule your first pickup, we’ll ask for your laundry preferences so that your laundry is done the way you like it. We use premium soaps, fabric softener (or not! ), and handle your clothing and washables gently to keep them looking their best. Floor To Door laundry is dedicated to making your life easier. Give yourself one less thing to worry about - We provide Top Quality Fluff N' Fold Pickup and Delivery Laundry Services - Same Day Service is available Monday thru Friday. Floor To Door Laundry wash-n-fold service is a simple and convenient method used by residents and businesses to send out their laundry to be done by professionals. Unlike dry-cleaning, this service launders your clothes in a washing machine and dryer similar to those you might have at home. Floor To Door Laundry service begins when we pick-up your unsorted soiled laundry. Upon processing, one of our attendants identifies the washing requirement of each item of clothing and separates them by color, temperature and degree of agitation. All clothes are separated into white and colored loads and washed separately from everyone else's laundry. Then an attendant safely washes every load with a high-quality detergent, mild bleach and optional fabric softener. They gently dry your clothes and carefully fold, then place each garment in our bag to return to you. It’s that easy! This means more time for yourself by letting us do your laundry. we’ll do that for you. 1. Click here, text:708-903-9731 or call 630-530-0870 to schedule a pickup. and put them on your door step (or in another place that you tell us). There’s no need to be at home for pickups or deliveries. Floor To Door Laundry bags that you can use for your future pickups. will be happy to accommodate your request. Are you a small to mid-sized Chicago area business looking for an effective and convenient way to get your towels washed? 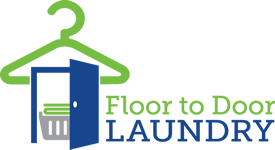 Floor To Doors's Commercial Laundry Service is the perfect solution for you! We provide schools, fitness centers, hair salons, medical facilities and other businesses with top quality towel service that is affordable and convenient! We would welcome the opportunity to taylor an affordable plan for your business! Please call (630) 530-0870 for more information.